Admission to the Museum is free due to the generosity of our members and donors. 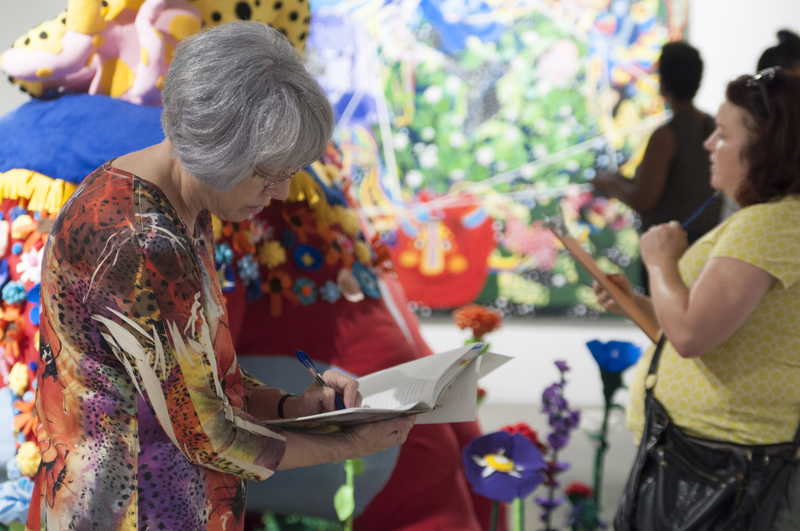 Join us for a guided in-gallery discussion or pop-up activity that provides a creative opportunity for you to experience the current exhibitions in a unique and meaningful way. Led by our FAQ (Frequently Asked Questions) Team, a group of artists and historians who assist with contextualizing CAMH’s dynamic exhibitions for diverse audiences. Drop-in Experiences are available between 1-4PM every Saturday. All ages are welcome. Tours at CAMH are designed to cultivate critical and flexible thinking. The programs developed by the CAMH Education Team aim to guide a visitor in the exploration of new spaces, ideas, and perspectives. 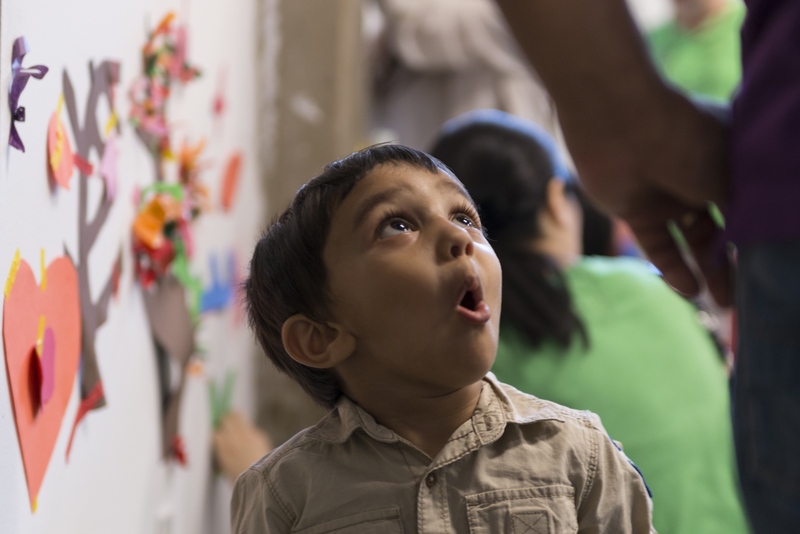 CAMH offers group tours for visitors of all ages, backgrounds, and interests. If you are interested in finding out more, contact tours@camh.org or 713.284.8276. 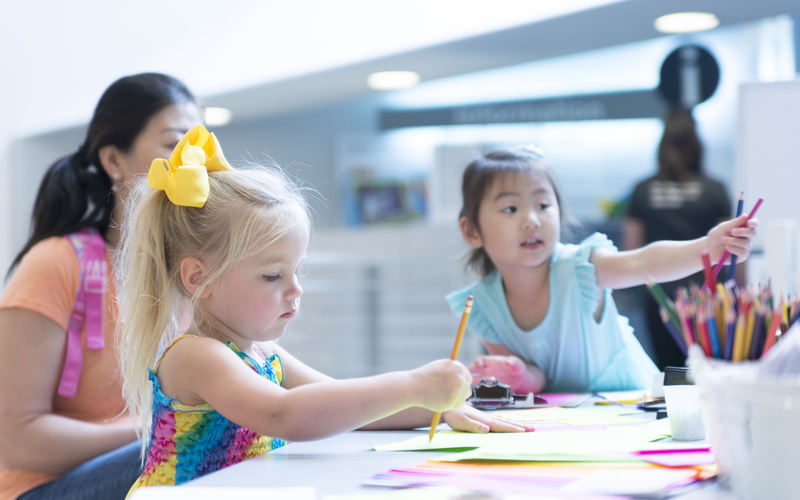 Family Guides are designed for children of all ages, and provide opportunities for exploration, discovery, and conversation about the art on view. The guides are available in English and Spanish for free at the front desk of the Museum. Contemporary Arts Museum Houston is conveniently located in the Museum District. CAMH is one of 19 organizations that make up Houston’s vibrant Museum District. Located within a 1.5-mile radius of the Mecom Fountain, Houston’s Museum District includes not only CAMH but the Museum of Fine Arts, Houston, The Menil Collection, the Houston Zoo, Lawndale Art Center, The Houston Museum of Natural Science, and many, many more. Spend the day in Houston’s Museum District! To plan your stay in Houston, go to visithouston.com. From the weekly food trucks to the local restaurants, there is something for everyone in the Museum District! Within walking distance of CAMH, you can find several restaurants serving a wide variety of cuisines, including Barnaby’s, Bodega’s Taco Shop, Pondi Café, Lucille’s, MFA Café, MF Sushi, The Monarch at the Hotel Zaza, and Pinewood Cafe. For more information on the curated selection of food trucks at the Museum of Fine Arts Houston, CLICK HERE. The Hotel Zaza is situated in the heart of the Museum District and features a beautiful art collection, delicious restaurant, and luxurious spa. The Museum District is also conveniently located near the Medical District, Downtown, and Midtown — each has a variety of hotel options. For more information about hotels near the Museum District, go to visithoustontexas.com/hotels or houstonhotels.org. Photos and/or videos taken at Contemporary Arts Museum Houston (CAMH) and associated events may be published in print or posted online for download, in online photo albums, on photo/video sharing sites such as Flickr and YouTube, and on social media sites such as Facebook, Twitter, Tumblr, Instagram, etc. Photos and videos may also be made available on CD, DVD, Flash Memory devices, or through email. By visiting CAMH and/or attending an event, photos and videos of you at the event may be published in any or all of the above mentioned media and devices at the sole discretion of CAMH. By your attendance at the Museum, you are consenting to photographs being taken and shared through the above-listed platforms unless you expressly revoke your consent by contacting the front desk to receive a sticker that will alert CAMH staff to not take your photograph. Please note that the CAMH staff members are instructed to ask permission from parents or guardians before taking photos of individual children. If a parent or guardian declines to have their child photographed, the Museum staff member has been instructed to refrain from photographing the family. If a staff member refuses to comply with your request, please email fcleveland@camh.org. Photographers may use CAMH grounds as settings for their photography shoots so long as they are respectful of other CAMH visitors and so long as they do not disturb CAMH grounds. Photographers and the subjects of the photographs are not allowed to touch any sculptures or to be in any water features or fountains. Photographers are responsible for following applicable copyright law. For all commercial and professional photography requests, including bridal portraiture, please contact CAMH Communications and Marketing Department during business hours by phone at 713.284.8255 or by email. Still photography for personal use is permitted, unless otherwise specified, provided no flash or tripod is used. Videotaping is not permitted. No photographs or videotapes may be reproduced, distributed, or sold without permission from CAMH. CAMH Gallery Attendants can help visitors identify the areas where photography is permitted. CAMH reserves the right, in its sole discretion, to withhold and/or withdraw permission to photograph on its premises. Museum personnel are authorized to enforce all policies and procedures included herein. If you feel you hold the copyright to an image found on CAMH’s website, please contact CAMH Communications and Marketing Department during business hours by phone at 713.284.8255 or by email. Contemporary Arts Museum Houston is firearms-free. Firearms, including without limitation handguns, shotguns, and rifles (whether concealed or openly carried) are prohibited on Contemporary Arts Museum Houston premises. See sections 30.06 and 30.07 for more information. For more information about the Texas “open carry” law, please visit houstontx.gov/police/open_carry.